A big thank you to Raise Brave Girl for following and noticing African ChangeMakers impact on the continent and beyond. 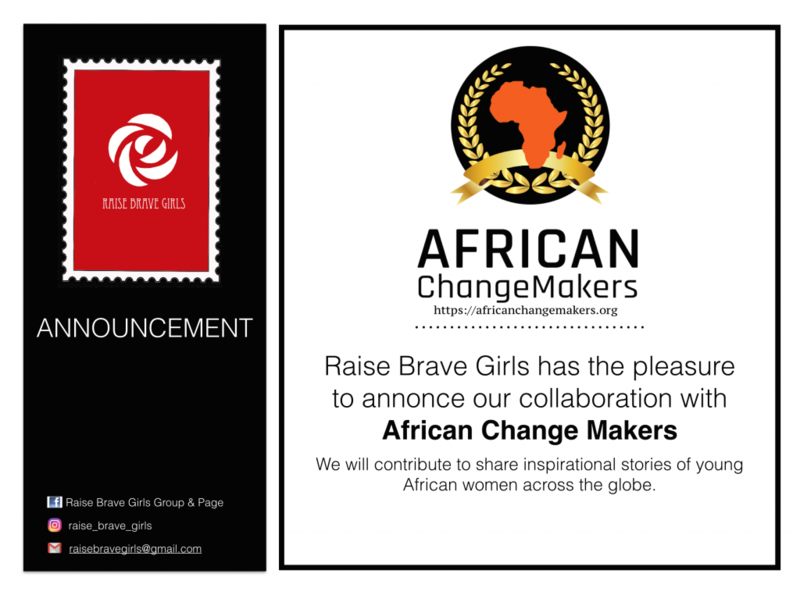 African ChangeMakers is announcing collaboration with Raise Brave Girls to feature and showcase the profile of some great women’s work of impact in African ChangeMakers to their network and the world as a whole. Raise Brave Girls will be publishing the inspiring stories of African ChangeMakers women twice a week starting Tuesday 26 June of 2018. Be on the look-out to read inspiring stories of African ChangeMakers women making impact in their community. About Raise Brave Girls: It is our duty to leave a sustainable legacy for the future generation. Yet, in 2017 a number of young girls and women are not motivated to pursue their dreams. They are still tied in the shackles of patriarchal society. Therefore, young girls and women are not in a position to work to their optimum level and contribute to the society. There is a need to raise brave girls and encourage them to become strong women. We need to boost up young girls and remove them from their comfort zone. We need to raise brave girls so that they pursue their dreams. We have to teach young girls to stand up of after each failure and forget the quest of creating perfect girls. We have to start somewhere and Raise Brave Girls is a global movement to motivate and inspire young girls in all fields. This campaign has been initiated by Mottee Prisheela and Mottee Dilsha with the support of Pearl Architectural Company.